A wonderful musical clock with colourful details. The upper section with frolicsome mice rotates to .. FANTASTIC! This stylish stool with trendy black design on white paint is a great addition to our pro.. FANTASTIC! This stylish stool is not just a stool, it is also a musical instrument! The hollow body ..
13 metal bells on a treated wooden handle for melodic rhythms! This great acoustic instrument supple..
A classic violin for musical children. Comprising a black bow with plastic hair and a plastic violi.. 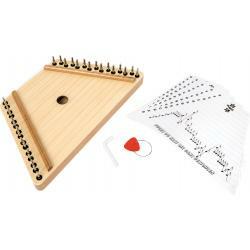 The motor skills and the sense of tact will be nurtured by this fancy instrument. It is equipped wit.. This cool electrical guitar made of solid timber includes 6 metal strings and is a must-have for any.. This musical toy in a classic acoustic guitar design arouses the interest in string instruments and ..
Children can practice rhythm and musical measure with this children's guitar. The six strings can be..
Prachtige felgekleurde houten sambabal in het roze met sterren. Laat deze mooie sambabal schudden, ..
Metal platelets for African tones sounding out of a resonance box made of varnished wood! The sound .. This "Sound" set is ideal for a musical performance in the playroom. Six different instruments with ..
Sophisticated musicians can train motor skills and rhythm using this premium instrument table (H: 13..